Accueil > Home>Lithophane "Les Grandes Eaux"
Lithopanes are made using a traditional engraving technique on very fine porcelain without enamel, which was invented in Limoges in 1828 by Paul de Bourgoing. The decoration is revealed by transparency and the play of light and shadows created by the light of the candle, revealing astonishing precision of detail and perspective. Starting in 1661, Louis XIV commissioned the finest artisans of his time to work on creating extraordinary gardens for the park at the Chateau of Versailles. Among them were the landscape architect Le Nôtre, the hydraulics engineer Francini and the architects Le Vau, Robert de Cotte and Mansart. For nearly twenty years, work was carried out on a colossal scale to tap water from different sources and conduct it to Versailles. Ornamental pools, water features and fountains were created, exalting the king’s greatness and symbolizing his power over his subjects. By the end of his reign, the hydraulic systems installed were such that the king could have 1,600 water features and fifty fountains all playing at once, which required nearly 72,000,000 liters of water. 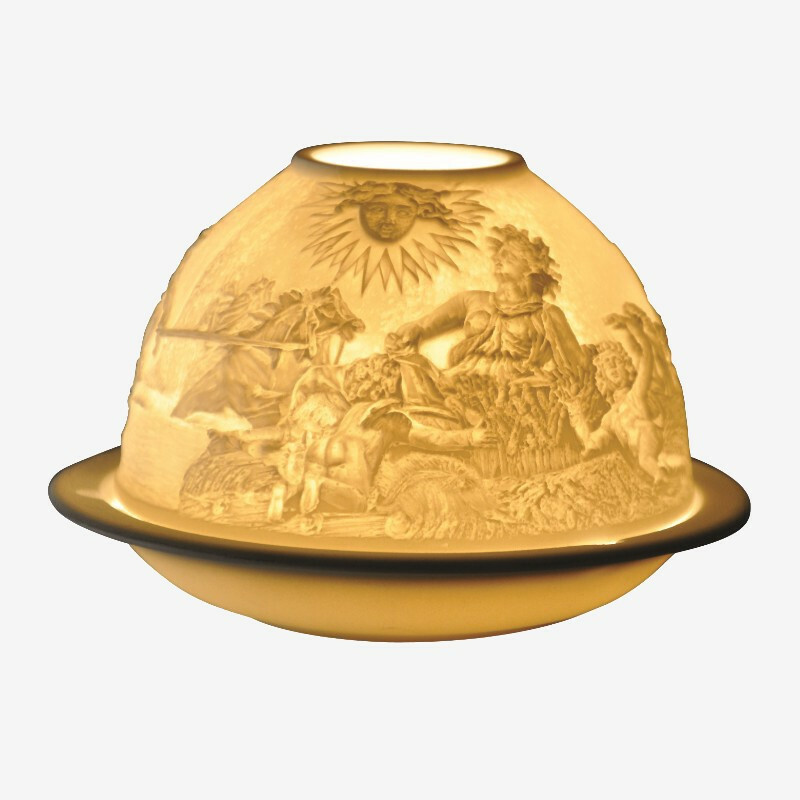 Lithophane depicts four fountains from the Estate of Versailles. Gracing the Bassin d’Apollon is a famous and impressive sculptural group representing Apollo as the sun god, symbolizing the king, on his chariot. The Bassin des Lézards surrounds the Latona Fountain, which illustrates the legend of the mother of Apollo and Diana protecting her children from the Lycian peasants and their insults. She called upon Jupiter to avenge her and, hearing her plea, he changed them into frogs and lizards. The Bassin de Bacchus, also known as the Autumn Fountain, is the same size as the three other fountains representing the seasons. It honors Bacchus, the god of wine and intoxication. The Bassin de Cérès honors the Roman goddess of the harvest. She’s seated on a bed of wheat stalks with cornflowers and roses. The fountain, symbolizing summer, forms a set with the Bacchus, Flora and Saturn Fountains, which represent the three other seasons.